We firmly believe that a good sandwich will go a long way, especially when you are having friends over. The pulled beef brisket pairs perfectly with the Asian-style miso slaw, making it a delicious meal for a lazy afternoon. This is one of those make-the-night-before-and-enjoy-the-next-day-type dishes. Much like the champagne-versus-sparkling wine debate, beef can only be referred to as Kobe if it is from that particular region in Japan. If the species is bred anywhere else in the world, it’s referred to as Wagyu. Season the brisket with salt and pepper, place in a baking trayand slow-roast, 10 hours or overnight. Once done, allow to cool, then pull the brisket apart using a fork. Mix the meat together with the hoisin sauce and oyster sauce. For the miso slaw, mix together the carrot, cabbage, onion and miso mayonnaise. Season to taste. 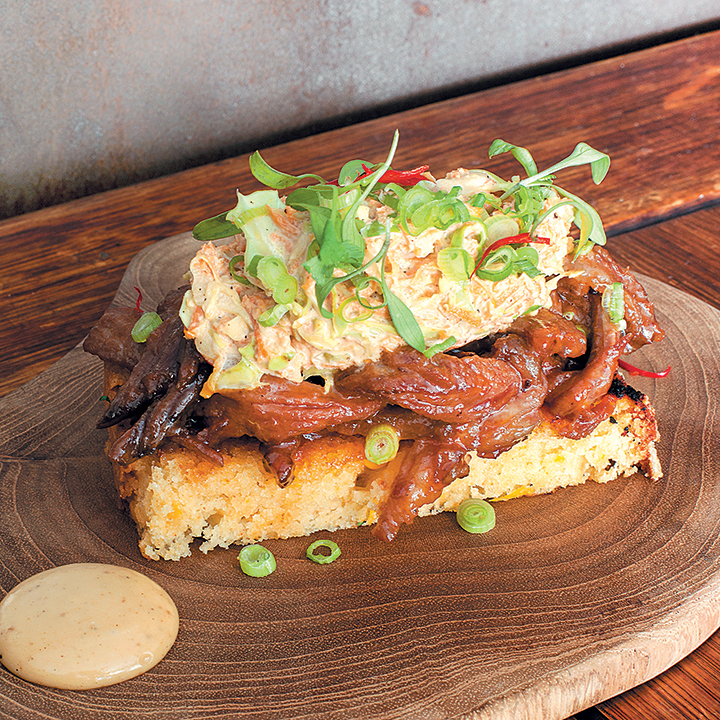 To assemble, place some pulled brisket on a slice of toasted cornbread. Top with some Asian-style slaw and sprinkle with chillies, spring onions and microherbs to serve. Add a side of miso mayo to garnish.